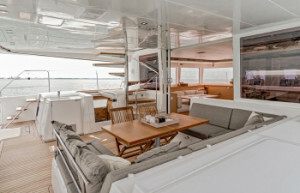 Sailing Catamaran Amazing Lady – a fabulous new Lagoon 560 S2 cruising catamaran offering the best in sailing innovation combined with luxurious accommodations and four social areas. 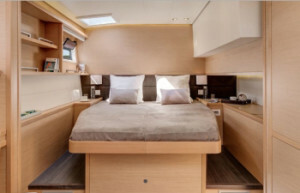 This catamaran accommodates ten guests in four queen size double cabins and one twin cabin. A superb choice for your caribbean holiday. The spacious salon offering 360-degree visibility and plenty of natural light features a large u-shaped lounge, the central social area and converts to an elegant space for formal indoor dining. Large sliding doors opens the living area outside to a spacious aft terrace. 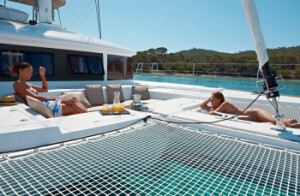 Here guests can relax under a large bimini that shades a table and seating for eight or more. For more information and specifications visit her on-line brochure (link below) or contact us at Nicholson Yacht Charter & Services for further information.